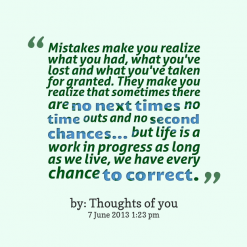 Lady Talks a Lot: When do you finally stop giving second chances. When do you finally stop giving second chances. I understand that most people have been let down or betrayed at some point in their lives. Usually by friends or first loves when they are in elementary or high school. But most of us learn from that. It is one of life’s bitter lessons, that usually helps us as adults to avoid or at least deal with situations where our hearts have been smashed, our trust broken or some has just proven that they are not meant to be part of our lives. Sometimes there is that one person you just keep hoping they will get their act together. Even though it is not likely you still in the back of your mind expect that one day they will change. 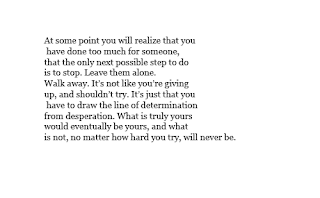 You wait at every opportunity to see if they will for once be the person you need them to be, even as you fully expect them to let you down one more time. It still hurts ever time they prove that they will never change even though they are given every opportunity to do so. 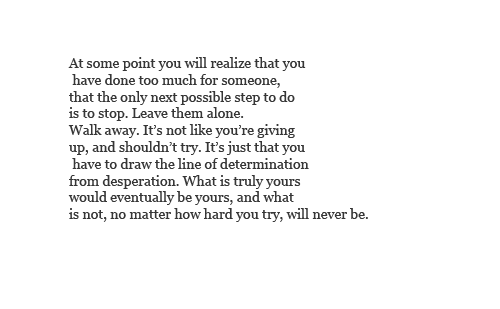 Eventually you have to simply walk away. Which sounds easy, but usually it is not especially if they are family. How many times do you let someone have the opportunity to let you down, disappoint or hurt you just because they are your mother, father, brother, sister, son, daughter or grandchild? How many times does the rest of the “family” pressure you into giving them one more chance? How often does the very person hurting you or letting you down make everyone else think you are the issue, not them? Or better yet convince your loved ones that you are being unreasonable, and are the black sheep, not them? Nothing like having a loved one turn everyone against you. I learned at a young age that my parents were not to be trusted, and did not have my best interest at heart. As a child I tried to get help, but people, including family believed the adults not the child. Even though I went to them year after year telling them what was really going on. Eventually I stopped, betrayed a second time by the adults I turned to. Other kids believed me, but what could they do. Eventually I became old enough to leave and I did. Other members of my family did help me go to school, gave me a place to live for a couple of years. But even then they never believed me, always supported my parents version of things. Even when my parents did or said something right in front of them they would self edit what happened. I think they simply did not want to see or deal with the truth. Over the years I grew up, moved out on my own. My father died, and on his death bed told me he never loved me, never wanted me and did not want me to even attend his funeral. My mother had tricked him by getting pregnant. Nothing I did not already know, but it still hurt that his last words were meant to hurt and harm. My only crime, I was born. I did not even tell my work place when he passed, did not cry a single tear. I just went on with my life. It was not like he was a part of my life before he died, I did not miss him. My mother on the other hand was still a part of my life. For the most part I just accepted that she would be there. I simply did not call her, or visit her. If she called or came for a visit I would talk with her, spend time with her but I would not go out of my way to do so. I was constantly under pressure to call her from other family members. Eventually I had to cut her out of my life for several years. Peace, finally peace. Then I let my family convince me to talk with her. So contact began again. Eventually I started my own family and shock of all shocks she seemed to be a good Grandmother. It happens, a bad mom but a great Grandmother. I felt safe enough to go to counselling, mainly to deal with things so I could be a good parent. I made the mistake of confronting my mother about my childhood, only to find out that she denied all of it and the things she could not deny “were not that bad and I deserved everything I got!” From what I can figure out she has self edited the reality to make herself the victim and has never done anything wrong. She decided that I was no longer her child and my children were no longer her grandchildren. Thank goodness they were too young to understand or remember her. However she started a campaign of hate right after that. She convinced everyone that I cut her out of our life, that I was denying her access to her grandchildren. She also convinced my family that I was demanding money, and things. All I heard was how horrible I was for not letting her even talk to her grandchildren. This from the same women who complained when I emailed her a photo of my children and told me not to send her pictures of them. It was easy for her to convince everyone that I had done this because she had been telling everyone that I was a liar since I was a small child. After all the things I told my family at 5 had to be a lie, a parent would not do those things to a child so it was easy for her to tell them it was a lie. After many years and against my better judgement I finally let her have contact with the kids. It was okay for a few years, but again she decided she does not want to have anything to do with us. She visited and confronted me about all the lies I was telling her parents and sister. I had not talked to my aunt in 9 years and I never talked about my mom to her or my grandparents. It turns out that she has been full of anger for most of my life. She was angry at me for “telling” when I was 5 years old. She has self edited her memories to the point that I was at 5 years old telling terrible things just to cause problems. That nothing was true. She was angry at me and resenting me for things I said to her parents when I was between the ages of 5 and 10. Some of the abuse came to light when I was eleven/twelve and she sent me to live with my dad for a year. So it comes down to the fact that she has carried that anger for 40 years and in her mind it is a fresh as if it was yesterday. She decided to cut me and my children out of her life again just like that. We don’t exist to her anymore. I have two children who don’t understand why Grandmother does not love them anymore, which is exactly what my concern was when I let her into their lives. My youngest daughter turned one today. No card, no phone call, nothing. She is lucky. She will never know her Grandmother and cannot be hurt by her. As usual I am hearing from my family that I must have done something wrong, after all I have always been the one who lied and caused problems. So the consequence of this is that now I don’t really have what I would consider family. 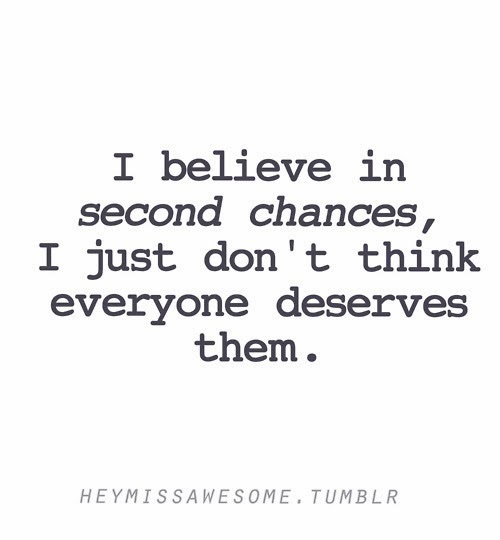 So when do you finally stop giving second chances. Well hopefully people will learn from my example and will do so long before they can cause this much harm. If being in contact with them is a negative experience then stop. 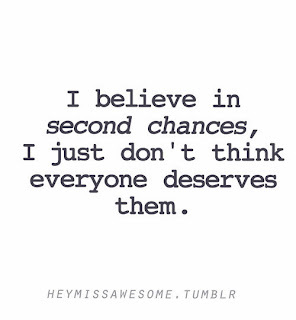 If they have an opportunity to hurt you or your loved ones it is not worth giving them a second chance. If other people support the other person, well you know where you stand with them, move on. It does not matter if they are family, or a long time friend. If someone is abusing your good nature, causing you to be hurt physically or emotionally or is just not fun to be around don’t waste your time waiting for them to change. They are not going to. Simple! If someone needs second chances and burns them but still expects more chances they have no reason to change, ever. The only thing you are doing is giving them the chance to use and abuse your relationship and goodwill. If people don’t understand why you don’t want to be around that person even after you explain it, they never will. Don’t try to convince them you are right, just let it go and put your time and energy toward making your life better, with positive relationships. Walk away from the negative. If it is someone who you have no choice but to deal with (co-parent) limit contact and do not let their issues become yours. It is hard to do, but having a better life is worth trying to do it. I don't speak to my toxic mother or siblings and it's been over a year - I feel great peace and freedom, I understand where you are coming from.